Mobile Office on Android! Oh sweet, sweet writing hallelujah . I used to get a heap done when I used an iPhone, for the simple reason that: Pages. Nothing I’ve found on the android can do text editing of large documents well in a way that synchonises seamlessly and allows you to navigate and edit intuitively… until I found this from Microsoft. And best of all: it’s free. The best price-point known to man. Apparently this happened a few months ago and I was just miserably unaware of it until now. If you’re not already writing on-the-go, have a look. How do you like to do your writing? Laptop? Tablet? Phone? If you use them, what are your favourite writing apps? In other great news, I wrote three new scenes last night. The not so great part is that these weren’t from the twenty or so scenes I’d planned to chip away at: they were additional ones that I realised were necessary. The word count hasn’t grown a great deal because I culled a heap of planner notes from the sections that I was working on (I like to keep track of what will go where in a story by writing short-form note paragraphs in ALLCAPS), but it’s still a thousand words longer than it was by bedtime on Sunday, so can’t be too unhappy. The old woman could read my reaction this time, because I almost choked on my whisky. “-and only one chance to come back out alive,” she finished. She picked up her teacup again in weathered hands, and smiled at me through the steam. I took another sip of my drink, and nodded. “And so, it would seem you need to work for me.” She extended her hand. I took her hand to shake it firmly, but with a care for her advanced years. I needn’t have worried, as her grip was full of vigour. “…for now.” She added, hopping down from her stool. She took up her cane, and headed over to sit in the back row of the theatre seating. I picked up my drink, contemplating how much trouble I was likely getting myself into… and noticed the crystal was empty. “Another drink, captain?” Timmy said. The kid nodded and uncorked the bottle, but then froze, looking past me toward the foyer. Not a moment later, the doors swung open, and a dozen Royal Navy seamen, ramrod-straight backed, red knuckled brutes with cabbage ears and strawberry noses, filed in on each side, two taking up guard positions at the door. I imagined that there would probably be another two mirroring them outside. The lines of sailors reached their positions in the encircling formation and snapped to attention with a click of polished boots. And then Commodore Provis himself strode through the door, and it slammed shut behind him. This entry was posted in Writing and tagged android, books, excerpt, fiction, goals, Microsoft Mobile Office, urban fantasy, Writing. Bookmark the permalink. I use Microsoft office app on the Android as well. I’ve always made sure that I have the app Swype installed on every device I own. After a while, the predictive text saves me loads of time. The thing I hate about Office is that I can’t use it on my Android tablet. For that device, I have to use Kingsoft, which is very good with using cloud storage (vital for anyone writing on the go without taking the laptop with you). And that’s also free. Couldn’t agree more about swype. 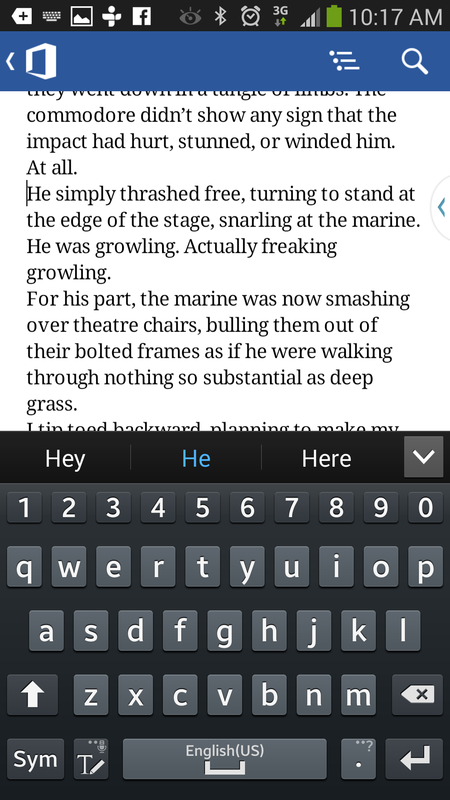 I’ve taken to sitting on the couch with my wife and writing with swype in an evening, otherwise I’d be sitting at my computer and we wouldn’t see each other. I can swype one-handed most of the time, and with a bit of music in the old headphones I don’t get the distraction from the TV. Kingsoft has been great for smaller works, but I found that it was hard for me to go back to the place I left off (had to scroll through dozens of pages each time), and occasionally it would load edits at a snail’s pace, especially on large files. I miss that kingsoft could use dropbox; on Office Mobile I’ve had to set up Onedrive.